We cried blue murder at the time. From the digits of a deity. We were all doing it. To create artistry out of artifice. I reblog this hand !!! Thank you – how very kind! nice!!! congrats on being freshly pressed. Some honesty at last. It took the WWW for me read it though no matter. A nice take on it. Well done Brian. How kind. Thanks so much! Just have to share this awesomeness with the rest of the world. How could the Referee not see that high hand? Was he paid not to? This world is not fair. I remember this, lol! 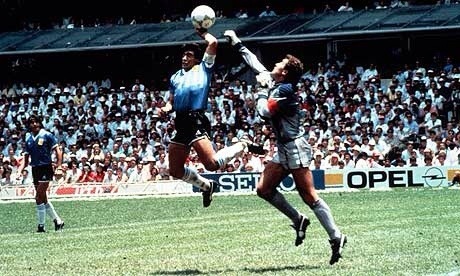 I was just thinking of Maradona yesterday and the hand goal! Thanks for sharing! This good God you speak of is a God of surprises. Did he help your game? Fantastic poem. To produce arguably the 2 most memorable World Cup goals of all time, within 5 minutes of each other, is an incredible feat. Yes, the ‘Hand of God’ could be seen as a moment of deplorable deception, but the quick thinking of Maradona, both to anticipate the ball and have the quick thinking to use his hand was, if such a thing is probably, the cheating of a genius. Anyway, great post. If you get the chance, it would be greatly appreciated if you could take a look at my blog! Thanks so much for the kind comments. Loved your piece on the state of punditry. I quite agree! As an England fan I remember seeing this and feeling so angry and cheated. There have not been so far another Mano Santa Maradona soccer genius after Pele. Messi is so good in making goals, but Maradona was quite different. Its been 28 years and its still one of the most shocking and talked about event in soccer history.